Home » Music » Choral » The Boar’s Head Carol. Ah, the pomp and the glory of the presentation of the Boar’s Head! The choir resounds throughout the hall with the fulness of the season! The stateliness and order of the procession! The manliness of the men! The loveliness of the women! The succulent aroma of this rarest dish, a meal for kings! All hail the Boar’s Head! 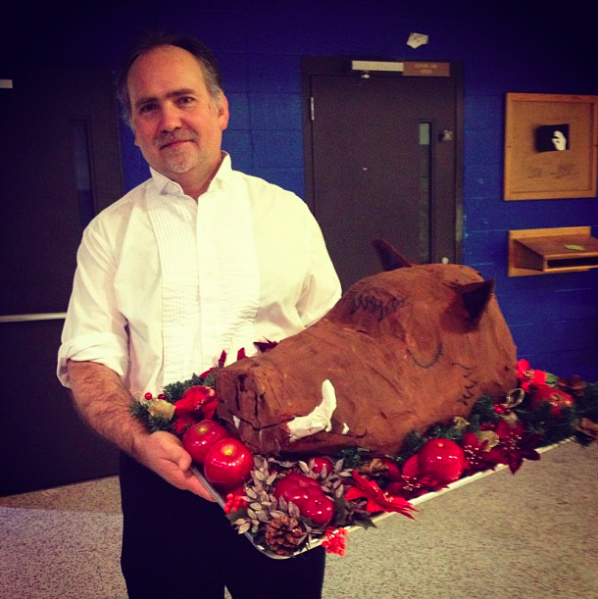 I first programmed The Boar’s Head Carol for a student performance at Blue Rock School – I believe it was in 1991. Blue Rock had a tradition of presenting a festive performance to celebrate the Winter Solstice each year, which I inherited when I became the music teacher there, quickly embraced, and thereafter retained as the approach I preferred when pulling together December musical performances in school environments after I left Blue Rock in 1995. Also at that time, a colleague at Blue Rock introduced me to the work of John Langstaff, his life’s work Revels, and in particular the tremendous performances that were presented seasonally by New York Revels, which we made a point to attend each year. These performances, and the spirit and philosophy behind them, informed what I did each fall with my students in a tremendous way. At this time of year, what I wished to give my students was an experience – irregardless of their religious or cultural backgrounds – that would ignite their imaginations and provide them with a sense of community: not only community with classmates, friends, and family sharing in the celebration, but also community with those who have gone before, with our ancestors. Ideally, a musical performance and celebration of the season holds the possibility of connecting us to the past, and our heritage as human beings, in ways no other experience can offer. The tradition of The Boar’s Head Carol comes down to us from antiquity: the popular version most often sung today dates from the early 16th century, and the tradition of serving the Boar’s Head at the celebration of the Winter Solstice (“Yule”) – and later, Christmas – has been practiced since ancient times. 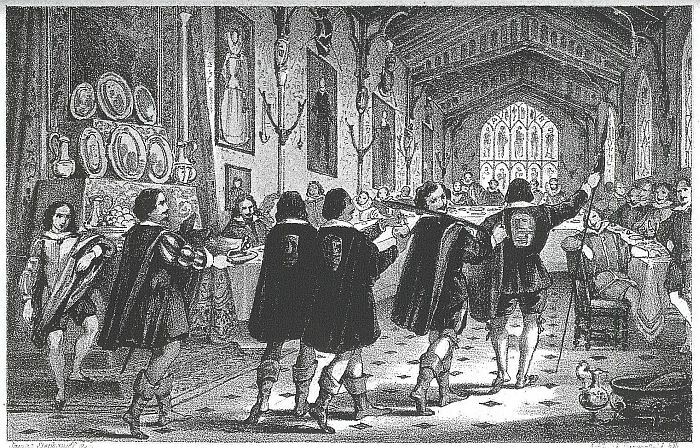 The English carol is associated with the tradition of the Boar’s Head Feast on Christmas Day at Queen’s College, Oxford, England. This ritual meal is held to have been celebrated annually for more than 600 years. 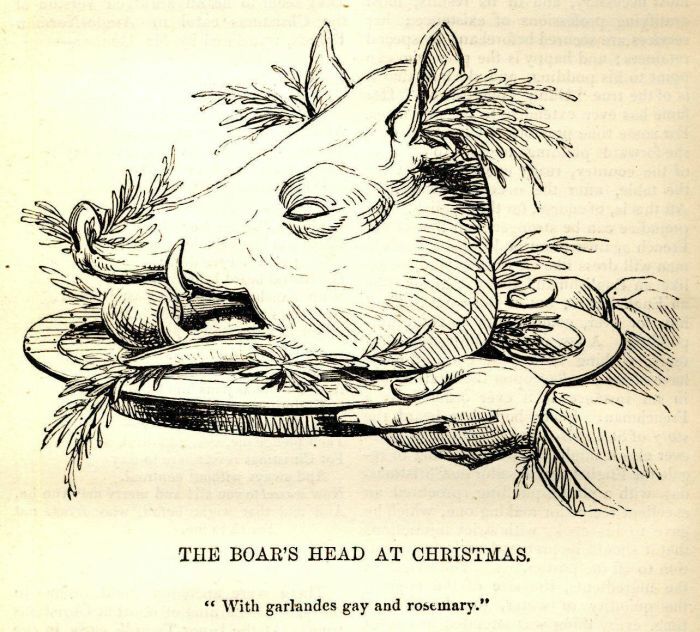 An excellent and exhaustive history of the carol and its tradition can be found here, and the Wikipedia page for The Boar’s Head Carol maintains a list of institutions around the world where it is celebrated annually. 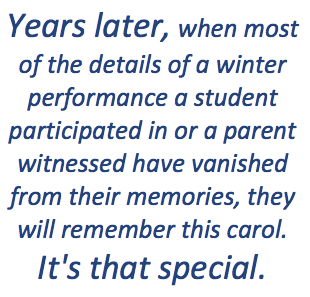 Years later, when most of the details of a winter performance a student participated in or a parent witnessed have vanished from their memories, they will remember this carol. It’s that special. By September, students would begin asking me when we would begin to work on it. 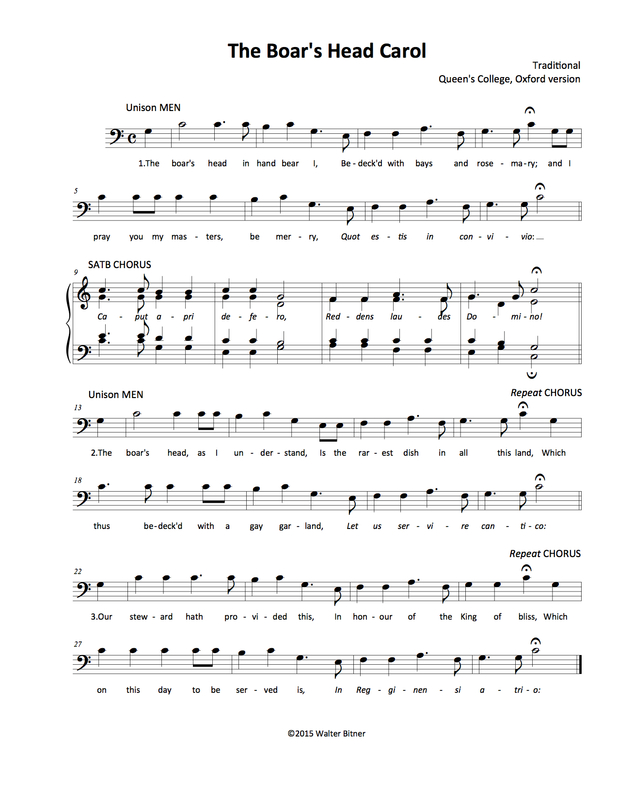 The unison verses are sung by the men – or boys – and the four-part chorus is sung by the entire choir. The men stand in place while they sing the verses, and process forward on the choruses. I would have the men begin at the back of the hall, spread across the back of the audience and singing over their heads towards the women of the choir at the front of the hall, for the first verse. Then they began to process down the center aisle in pairs, with the first two pairs carrying the Boar’s Head platter on a trestle held on their shoulders. The visual and audio effects of this carol are grand for the audience! If we had a table on stage as part of the performance and an actor(s) to present it to, the Boar’s Head would be reverently placed before him and/or her at the end of the carol with flourish. If not, it would be placed on the table of some august personage in the audience (usually the principal). However, the best version I have come across is by the English composer Elizabeth Posten, and includes two wonderful instrumental descant parts for the verses (I have had students perform these on recorders, violins, and/or oboe) and a climactic alternative final chorus which places the melody in the bass part. I found this arrangement years ago in The Christmas Revels Songbook compiled by Nancy and John Longstaff, which seems to be available here at the Country Dance & Song Society store. It also seems to be included in Carols for Choirs 1 from Oxford University Press. I never had any trouble convincing high school art students and their teacher to create a beautiful paper-maché boar’s head dish replete with trimmings for us to use, year after year. In schools with a younger population, the students who made the boar’s head were also members of the choir! I intentionally retained a few elements of my winter concert/performance the same from year to year: The Boar’s Head Carol, Personent Hodie (the processional carol with which we invariably began this performance that I have included in part 3 of my solfège series here), a Mummer’s Play, and the recitation of Susan Cooper’s moving and momentous poem The Shortest Day. The repetition of these elements each year helped to create a sense of tradition for the program and the event, gave returning students something to look forward to and to pass on to the younger students, and also made the preparation of a robust repertoire for the program possible within the short period of time we had to prepare it, as most of the students already knew some of the music when we began the year. I’ve never eaten boar’s head, have you? Students of every age took a sort of gruesome delight in contemplating the idea, and inevitably threw everything they had into the performance of this carol. In 2006, at Linden Corner School here in Nashville, I wrote an elaborate script for the Winter Solstice performance. It was titled The Feast of Stephen, and it was set at the court of Good King Wenceslas, with students playing all the parts and performing all the music. We had fun with this carol in that play. Fool: The wassailers and the Court have arrived for the Feast of Stephen. Is the kitchen ready? Page: The boar’s head in still in the oven, I believe. Fool: Very good. Is the wassail ready? Page: The cook has just put the cider on the stove. Fool: Very well then. And where is the Good King? Page: Ah, the Good King. He, ah, went to look out. Fool: He went to look out? Page: He went to look out. Fool: On the Feast of Stephen? Fool & Page: Deep and crisp and even. Page: Your Majesty, The mummers have not yet arrived, but the boar’s head is ready to be served! Good King Wenceslas: Blast! It will be a sorry feast if we have no mummers to play for our dessert. We hope they have not been eaten en route. This accursed dragon hath laid waste my kingdom, eaten my knights, and now even threatens to spoil our winter solstice celebration! We had hoped to feast on dragon tail this year and dispense with the gnarly old boar’s head for a change…still, a tradition is a tradition! What would the Feast of Stephen be without it? Good King Wenceslas: Indeed. Perhaps you have something there. Next year, let’s have tofurkey instead. But there’s no use letting all of our cook’s labor go for naught. Bring on the boar’s head! Page: Bring on the boar’s head! This audio recording of Steeleye Span performing The Boar’s Head Carol from 1977 is not traditional by any means, but it features the incomparable Maddy Prior, and the drama of the band’s entrance after the long a cappella arrangement of the carol is magnificent. By walterbitner in Choral, Early Music, Education, Medieval, Music, Music Education, Philosophy, Winter Solstice on December 10, 2015 .